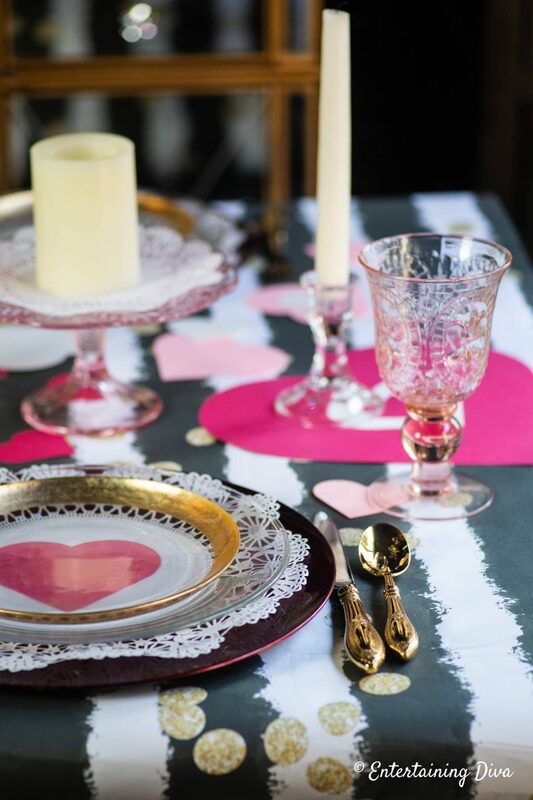 Creating a romantic table setting as part of your Valentine’s Day table decor doesn’t have to be difficult or expensive. 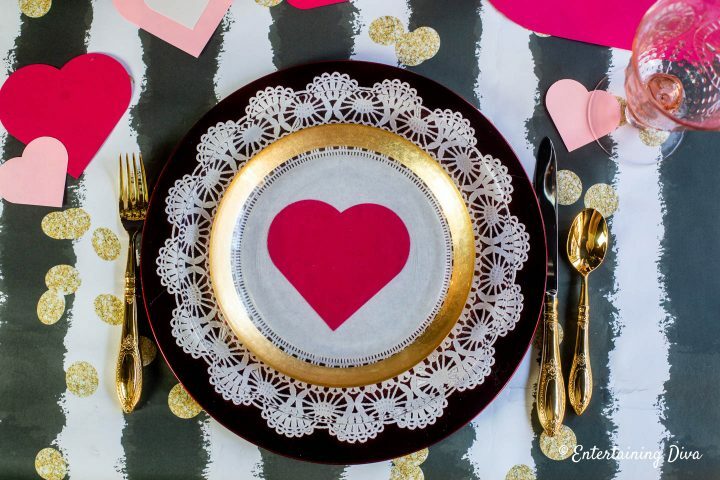 This easy paper heart Valentine table setting uses wrapping paper, construction paper and paper doilies to create a pretty tablescape that doesn’t break the bank. I love to create table settings for parties, and getting together with friends, and sometimes for no other reason than a pretty table makes me happy. I think it’s because you can change the whole atmosphere of a room depending on how the table is set. 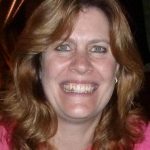 Since I live in an open concept house where my dining area is open to the kitchen and the living room, that means pretty much the whole main living area of my home feels the change. 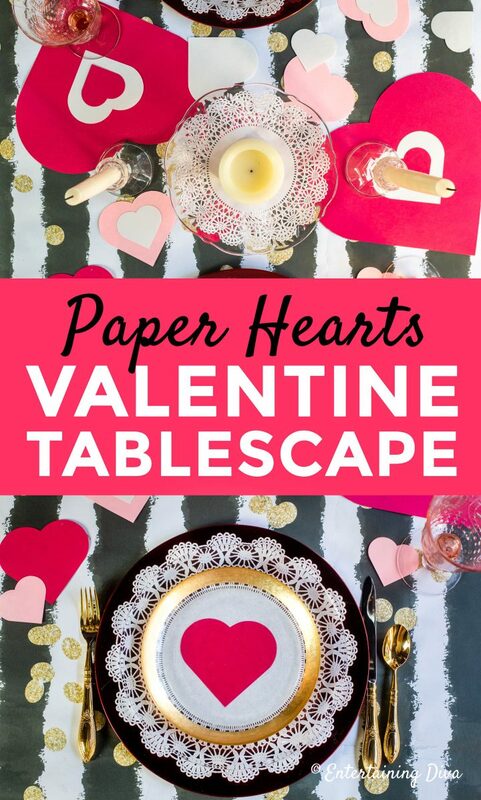 And if you saw last week’s winter wonderland tablescape, I think you’ll agree, it feels completely different to this fun and really simple paper heart Valentine table setting. 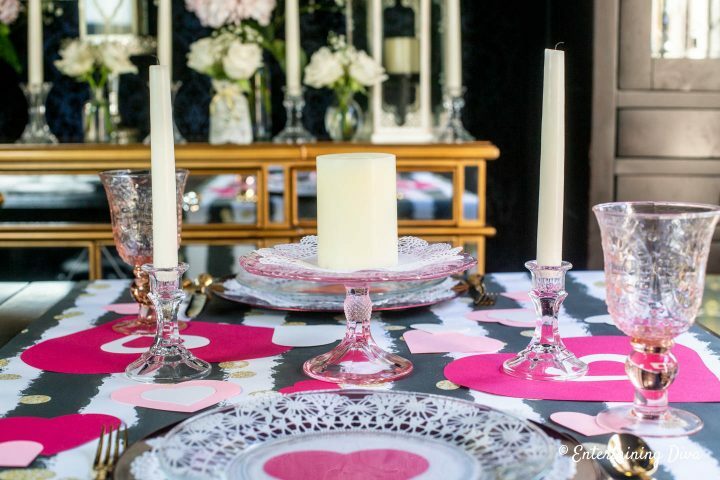 As you may have already guessed, the whole inspiration for this table was hearts. To be specific, paper hearts. As in, the kind that you cut out of construction paper like you did when you were a kid. I made 3 different sizes of hearts, in 3 different colors of construction paper (red, white and pink). 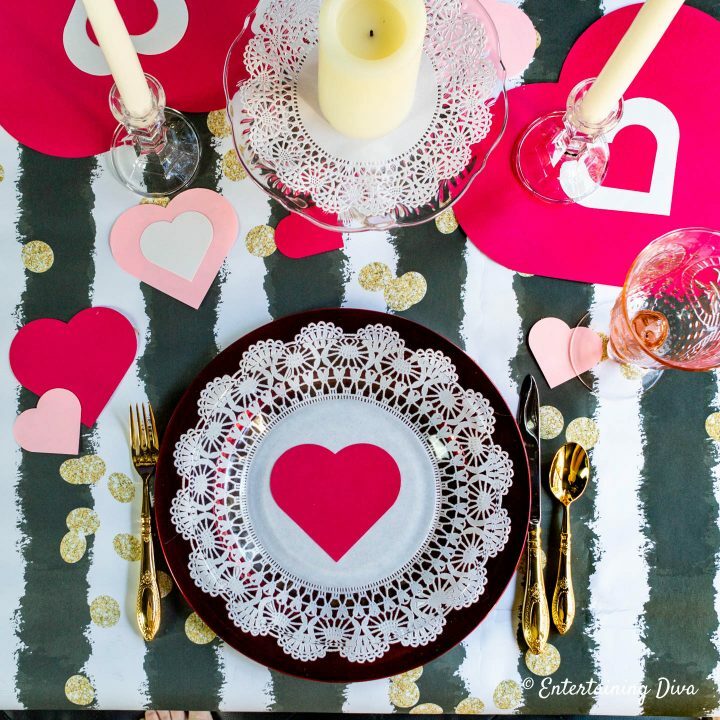 I put down black and white striped wrapping paper (one of my favorite inexpensive ways to create a table runner), and sprinkled the hearts around the center of it. 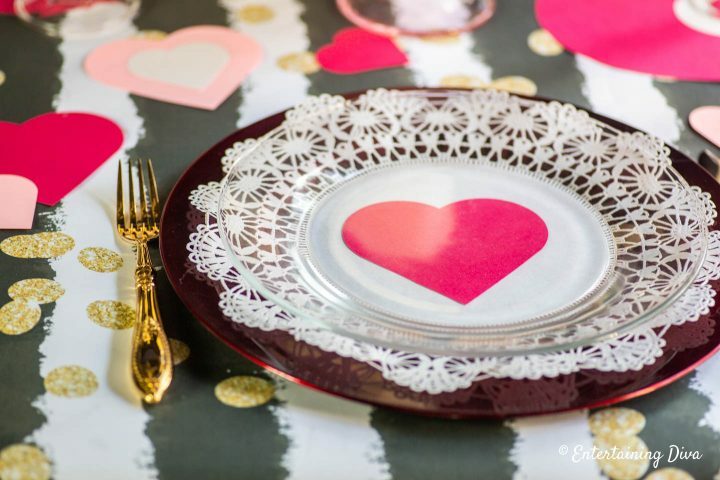 I was looking for an easy way to create a place setting that would still carry on the paper heart theme of the table. So I went hunting through my dish collection and found some red chargers left over from Christmas a few years ago (these are plastic…very inexpensive!) However, if you don’t have red chargers, you could also cut a larger red heart out of the construction paper and use that as a charger. (That was my plan B if I couldn’t find a charger that I liked). Next, I added a white paper doily and a red paper heart in the middle of it. In order to see the Valentine’s Day decor on the charger, I opted for clear glass plates. They are perfect for times like this! Since the wrapping paper had gold dots on it, I went with gold cutlery. And finished the place setting off with a pink goblet. Because I always like to do layers for my place settings, I decided at the last minute to add a gold rimmed salad plate. It ties in with the cutlery and frames the heart under the glass, which almost makes the heart look like it’s jumping out at you. Since the hearts already make a pretty big statement on the table, I didn’t want to add too much more to the centerpiece. However, I think it’s hard to have romantic table decor without having a few candles. So I added two taper candles in these really inexpensive glass candle holders. Because they’re all clear glass, the candle holders add the romance without covering up all of the hearts. 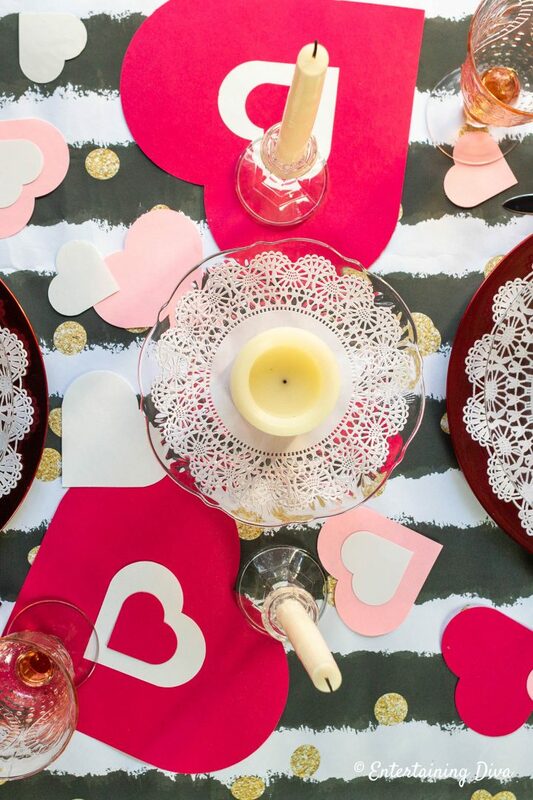 That’s all there is to putting together this really easy Valentine’s Day table setting using wrapping paper, paper hearts and doilies. I love how cheerful the table is. Even though most of the table decorations are made from inexpensive materials, it’s still pretty enough for a romantic dinner or a get-together with friends. 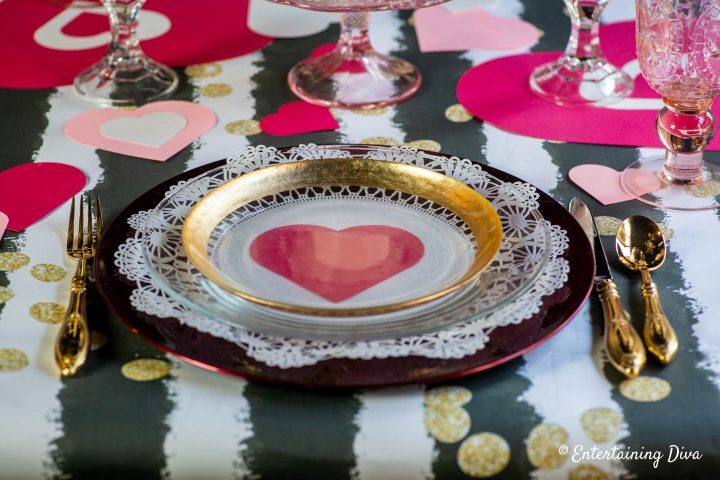 Hopefully, you’ve found a few ideas for your own easy Valentine Day table setting. 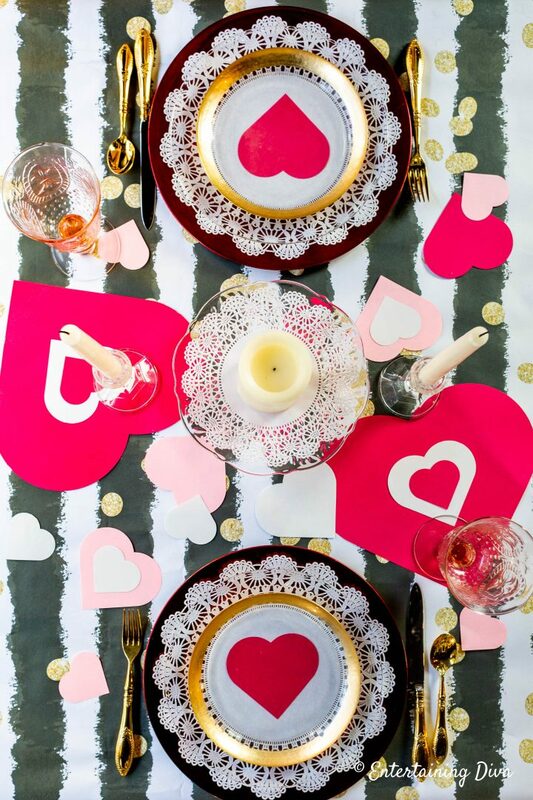 Have comments or questions about our easy paper heart Valentine table setting? Tell us in the section below.